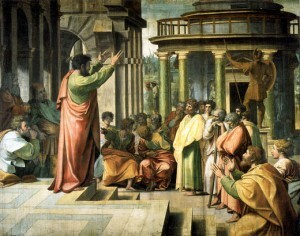 As author Dillon Burroughs shares via Skype video conference with my Evangelism Ministry class, I cannot help but to think about how much evangelism must have been a normal part of the Apostle Paul’s life. I mean the dude just oozed sharing the Message of Christ with other people. After watching the video of Dillon sharing on this passage and covering these points, what do you take away that you can apply today to your personal evangelism strategy? Which of these points do you struggle with the most? Which do you have the most success with? How/why?